There are at least three different places along I-395 where you can stop and walk down to the lake, but the best place to wander through some amazing Tufa is at the South Tufa Grove, just a few miles east of I-395 via CSR 120. And remember, it's Tufa, not Tofu. Ok, so what the heck is Tufa? Well, it's basically common limestone. 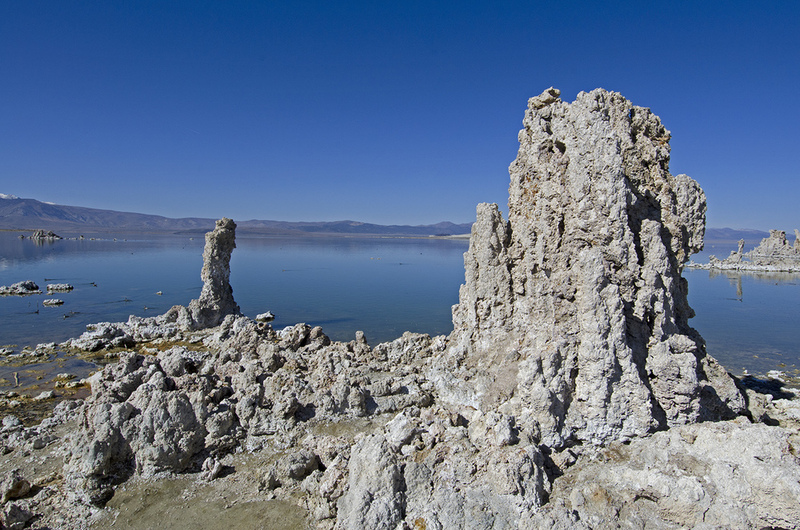 The Tufa Towers at Mono Lake formed when underwater springs rich in calcium mixed with lakewater that was rich in carbonates (the stuff in baking soda). When the two come into contact, a chemical reaction occurs which creates calcium carbonate (limestone). As the water comes out of the spring and reacts, the particles formed then settle around the spring and over the years, a tufa tower will grow (up to heights of 30 feet!). They only grow underwater, however. The reason we can visit the towers around the lake today is because of the water diversions which began in 1941 (when the LADWP began hijacking water from the streams which fed Mono Lake, reducing the volume of the lake by half and dropping its level some 40 feet). But someday, the tufa towers may no longer be visible. 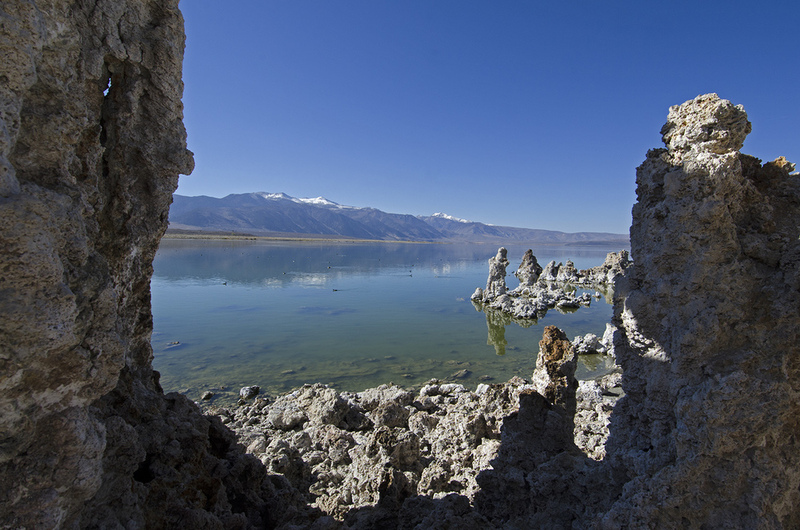 After some 16 years of court battles and public hearings, the Mono Lake Committee and its allies won a victory in 1994 over the LADWP, which was ordered by the California State Water Resources Control Board to halt all withdrawls of Mono Lake water until the lake climbed 17 vertical feet. I'm not sure how long that will take, but it may submerge many of the towers now visible along the shore. So go see them soon. As I walked down the path towards the lake, the closer I got the more I noticed the particular aroma that is often associated with the lake and the shoreline, but it wasn't really all that bad. The eerie, twisted shapes of the tufa towers are pretty captivating and I got used to the smell. As I walked through them, I couldn't help but be reminded of the Trona Pinnacles I had visited a few days prior. They're basically the same, created by the same process, but just on a different scale of size. There are two islands in Mono Lake, both created from volcanic activity, as were the Mono Craters to the south -- by one report the youngest mountain range in North America. The lake has a unique eco-system going on which includes algae, brine shrimp, billions of flies and some 80 species of migratory birds. And it's improving with the rising level of the lake.